Are Knowledge Ascriptions Sensitive to Social Context? Plausibly, the stakes in a practical task at hand can affect how people ascribe knowledge. I propose a new psychological account of the effect. My hypothesis is motivated by empirical research on how people’s judgements are sensitive to their social context. Specifically, people’s evaluations are sensitive to their ‘psychological distance’ from the scenarios they are considering. Experimental philosophy has found that what’s at stake for a fictional character in a fictional scenario has little effect on how participants ascribe knowledge to them. My hypothesis predicts this finding. (This illustrates a general problem for X-phi: one should not extrapolate from vignette studies, ignoring the possible effects of social context on cognition.) 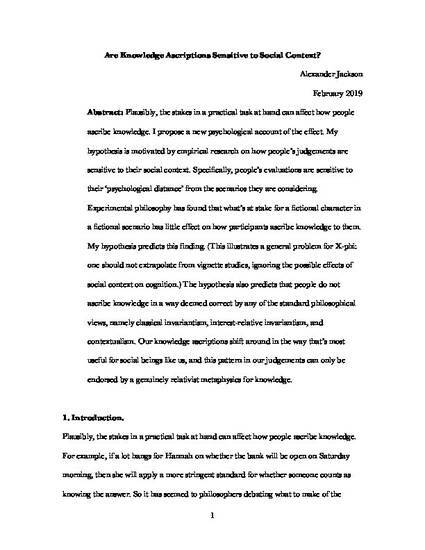 The hypothesis also predicts that people do not ascribe knowledge in a way deemed correct by any of the standard philosophical views, namely classical invariantism, interest-relative invariantism, and contextualism. Our knowledge ascriptions shift around in the way that’s most useful for social beings like us, and this pattern in our judgements can only be endorsed by a genuinely relativist metaphysics for knowledge.